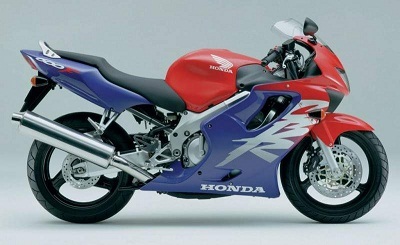 With our earlier look at the classic CBR600s, here we look at the late-1990s to the mid-noughties middleweight Honda classics! Like Suzuki’s traditionally double-cradled GSX-R750, it was almost impossible to consider an aluminium beam-framed CBR600, but it happened in 1999 with the F-X! Here was a bike that didn’t quite set the world on fire looks-wise – thanks to that year’s Yamaha YZF-R6, but it turned out to be a very capable machine which many people loved more than the razor-sharp R6. With the similarly sporty Kawasaki ZX-6R Ninja turning up mid-1990s as well as the SRAD-aping Suzuki GSX-R600 the Honda CBR600F-X-on had to work hard to keep itself in the spotlight. With the 1995 Kawasaki ZX-6R F-1 models and later G models of 1997 as well as the new Yamaha YZF-R6 of 1999, the CBR600F-X had to be better than before, but still it had to be the do-it-all ‘F’ model that made it all things to all men (and women.) Out went the old steel frame, replaced instead with an ally beam-frame, new 43mm forks and updated brakes. The motor was designed some time before the chassis and featured revised ram-air with side-mounted intakes, larger radiator, more plates in the clutch for a lighter action, all adding up to almost 100bhp on the dyno and breaking the 160mph barrier. Meanwhile a 180 rear-section tyre and bolt-on sub-frame hinted at race intentions in the World Supersport category. Weight overall was now 170 kilos. Changed aesthetics gave the CBR a sportier, two-headlight glare for the first time ever. Apart from the new clothes, the new addition was that of the fuel-injection system that was developed from the FireBlade’s and a bigger air-box. Power was still around 100bhp and weight was the same at 170 kilos. For a better chance at the World Supersport title, in came two models – the F and F-S or F-Sport. Differences were minimal. The F-S had a two-piece stacked seat, different cams, valves, lighter flywheel, an extra clutch plate and black-finished frame and swingarm. The F-S was dropped with the arrival of the sharper ‘RR’ in 2003. It seemed that despite the CBR600 being an ‘F’ model – which meant road-manners and civility – the likes of Satoru Horiike (he who designed such bikes as the Freddie Spencer NSR500/250 of 1985, the VFR800 and the CBR600F-X) wanted to make a real, race-version ‘RR’ of the humble CBR600F-model. And he did it: for 2003, in came looks from the departing Valentino Rossi’s RCV211V and an almost identical rear suspension linkage and braced swingarm. An all-new engine with centre-up under-seat exhaust and updated fuel-injection system pushed power to around 110bp with a 165mph top-end and a weight of 169 kilos. Brakes were now 310mm discs at the front. From 1999 despite success elsewhere, Honda didn’t do too well with the F-X: the best finisher in the 1999 series on a Honda was 10th, with our own James Toseland in 11th while the Suzuki GSX-R600 took the title with Stephane Chambon. The following year Jorg Teuchert won the series on his Yamaha YZF-R6, and in 2001 Andrew Pitt took the win on his Kawasaki ZX-6R. With the onset of the dual F1/F-Sport model of that year Honda’s intentions were clear – to win the World Supersport title. And they did just that with the talents of Ten Kate and Frenchman Fabien Foret who won in 2002. After that, the TenKate boys dominated, with more titles coming with Chris Vermeulen (2003) Karl Muggeridge (2004) and back-to-back title wins with Sebastien Charpentier (2005/2006). After that we saw Kenan Sofuoğlu take the 2007 title with the CBR, while former 2001/Kawasaki-title holder Andrew Pitt took the 2008 title.